Finding high-quality images for your content marketing can be quite a difficult task. Especially when it comes to copyrights, public domain and usage clauses. There’s no point writing a quality piece of content if you’re going to put substandard images in your article. If it’s your job to find these images online then you should find this handy little resource quite useful. It might even be a good idea to save this page or bookmark it for later use so you know exactly where to come to find your royalty free images. With any luck, they should save you hours of trundling through the many different websites that appear to offer you free images but often come with copyrights and clauses. Here’s a list of “My Top 10 Royalty Free Image Websites For Your Content Marketing.” In no particular order. 1 Why are images important? 2 Why are images powerful? In today’s busy world you’ll find that most people have the concentration of a gnat. Getting and holding their attention has never been harder. That’s why time in care need to be taken when choosing images for your content marketing and we can also include social media in that bracket too! I’ve included social media because the type of image you use as a feature for your article and also within the article have to look good on social media if you’re going to make contact marketing work for you. Even though we all learnt to read school. a pretty big part of our brain is still focused on visual stimulation. Our brains and can process images at an amazing speed and recognise a familiar object in milliseconds. Because of this, we use images as a way to grab somebody’s attention and also communicate with them. A social media post is likely to get 10x the engagement when it is accompanied with an image than without one. Did you know that words don’t actually exist in our brains? Yeah, I was pretty shocked by that too. We don’t even see words as a series of letters we actually see them as pictures. So, when you see a word you don’t see individual letters you see a group of letters that make up an image. We look at both the horizontal and vertical lines. We also look at the curves of an image which reports back to my brain so that we can check our internal database to figure out exactly what it means. As we get older we manage to get really good at this and now it only takes milliseconds to figure out what a word means. even though we’re really good at this, you still need a lot of brain processing power to recognise and work out each word in a sentence. That’s why, when you are presented with text at a presentation you find it harder to engage or find the presentation interesting because it’s just too much work. These days we only remember around 10% of what we read. however, on the flip side if an image is added that figure goes up a whopping 65%. Take a look at this SlideShare presentation by Hubspot of the 10 Do’s and Don’ts of using stock images. Simply click on the header or the image to view each website listed. Probably one of the largest royalty free image websites on the planet. Pixabay has one of the largest databases of images you can use. You also have the option to explore the “editors choice” of images, you can view videos, view by photographer (if you like a particular photographer’s work) and even by the cameras used. Funny enough, a lot of people use this website after being threatened with lawsuits from Getty for unlawful use of their images. Other than Pixabay, Unsplash is probably one of my favourite websites to get my HD images. Unspalsh has 300,000 free high-resolution images brought to you by the world’s most generous community of photographers. So why do these photographers post their images on there for free use? They are providing a small portfolio of their works in the hope of being hired by people who view the website. So it’s kind of like a win, win really. What I like is the fact that thousands of new images are being added daily (so you’re never stuck for new photos to use). You have the ability to search for an image in the search bar at the top (which automatically starts searching as soon as you start typing in your word). You can also click the “Collections” tab at the top which shows you different collections curated by certain people which is cool. FreeImages is exactly what it says on the tin really. It’s a website that has thousands of free and stock images to choose from. Be careful though. Like a lot of the other image websites, to make additional money the website heavily promotes iStock images which are premium images. StockSnap is a great website to get your images. Like the other websites, it’s really easy to use by simply typing in a keyword to find images you can use. It is basically a collection of curated images of 100’s of CC0 photos from free photo websites that are supported by contributing photographers. 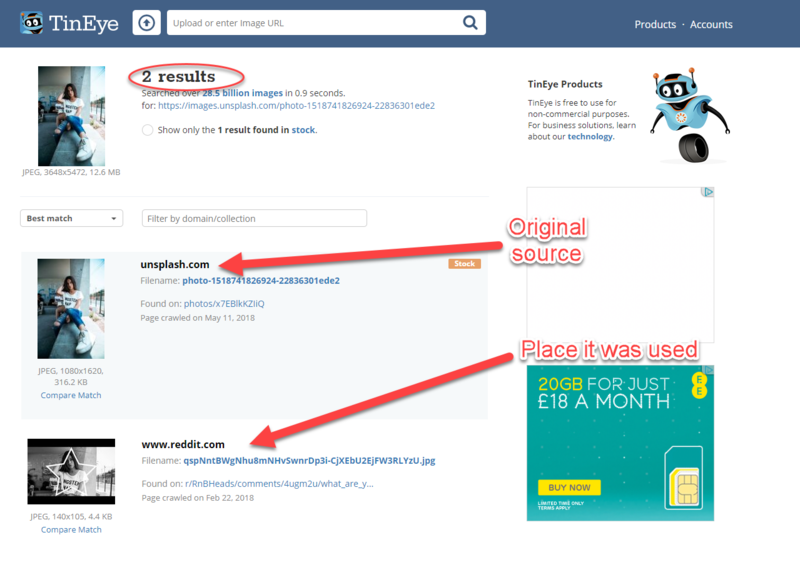 What I like about this website is the ability to trace the image back to the original source which makes it easier to verify the CC0 license. Filtering options include date, trending, views, downloads and favourites. Throughout the website, you also have links to premium images from Shutterstock. It should be pretty easy not to confuse these since they have a huge watermark across them. This is the first website I came across when I first started using images for my content. It is a (CC0 Curated) website that contains over 30,000+ images where photos are added daily. To be honest, it doesn’t have one of the largest choices of images, but they are curated from CC0 sites such as Little Visuals, Gratisography, Unsplash, Pixabay. It’s really hard to get a decent screen grab from this website as the display image isn’t great quality. Since the images are curated from other websites, I generally don’t use this website anymore. This is another website like Pexels that curates images from other websites. It uses iframes (nothing to do with Apple) to insert content from other free image websites. These iframes allow you to browse a lot of free stock websites in one location which speeds up your research on the websites to choose from to get your images. I have personally never used this website, but it certainly worth a look if you want to see a collection of images from multiple websites. This website was started by photographer Victor Hanacek in 2013. He started it because his images were rejected by stock photo sites. Unlike the other websites that show you a collection from multiple photographers. These are Victor’s own works which makes it really easy to deal with any copyright issues should they arise. With over 1500 photos, there’s plenty to choose from. The website also offers a premium membership for images not listed. Similar to AllfreeStock, FreeRangeStock uses iframes to view over 17 websites in one browser tab without having to leave the website. Simply click on each frame to view a collection of images available. Even though these images are royalty free it does not mean that no attribution is required or that all the photos are free. To be honest, you should really try to attribute your images when you use them anyway (something I have started doing since writing this article). Note: Not all sites are CC0 only. 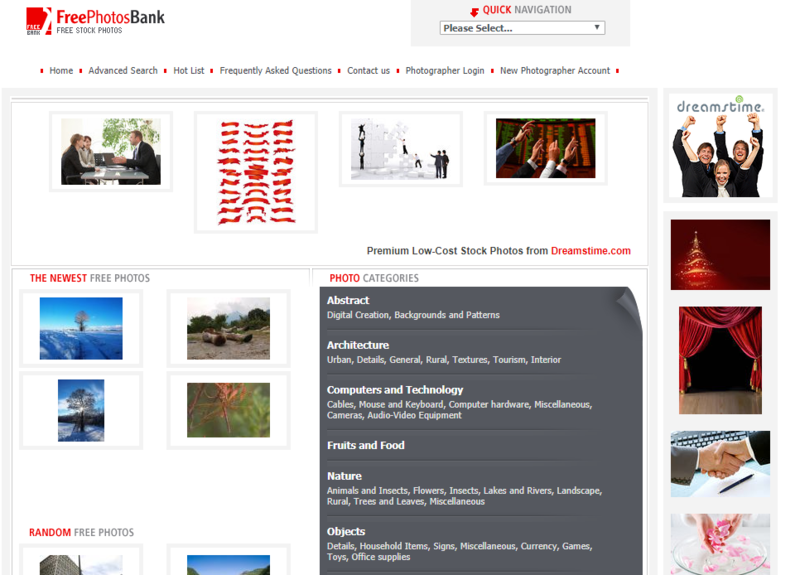 The Free Photos Bank site provides what you could call a typical range of images. To be clear, these are a collection of stock images ranging from people, animals, landscapes etc. You won’t really find any images that are groundbreaking and cool. However, the reason why I have listed this website is the fact that their abstract shots, backgrounds and digital artwork are really good. The look and feel of the website is a bit 1990’s, but that doesn’t mean you won’t find decent images on there. Last but not least is Freephotos (nice easy name). This is another free resource where you can find creative commons photos for your website or print projects. With a search bar at the top, you can easily search for several different images, browse and download. FreePhotos.cc uses a script from other stock providers which basically collates different photos and images in one place which makes it easy to preview. I absolutely love the user interface of this website which is both modern and really easy to navigate. I’ll be honest, I never download images from these websites using their download buttons or tools. I always do a screen grab of the image using screen grab software like Snagit. I do this because downloading an image directly from a website normally has a few other unwanted codes (source code) and items in the background of the image. By screen grabbing an image, I basically remove any background code and in essence, produce a brand new from the original for my personal use. If there was a choice you would use real photos in all your content. however, taking pictures of real people, getting exposure right and having access to a whole range of different images is really difficult. That’s why the vast majority of us use stock photography. The only problem is, there are several other thousand people all around the world using the exact same images for their content too. Even if you use a more premium service like iStock or Shutterstock you’re still going to be competing with thousands of people around the world for the exact same images. So when selecting your next image just remember that it’s not going to be entirely unique and will often be seen on other websites and other articles. To see who else is using an image you are thinking of using try this website called TinEye. This is a handy tool that allows you to do a “reverse image search” simply by inputting the URL address of the image. obviously, this will only bring up a small selection of results because most people are using the technique I explained earlier of screen grabbing images. but, it does give you a good indication of how popular that images though. Alternatively, you could do a Google image search by dragging the image you want to use in the Google image page.